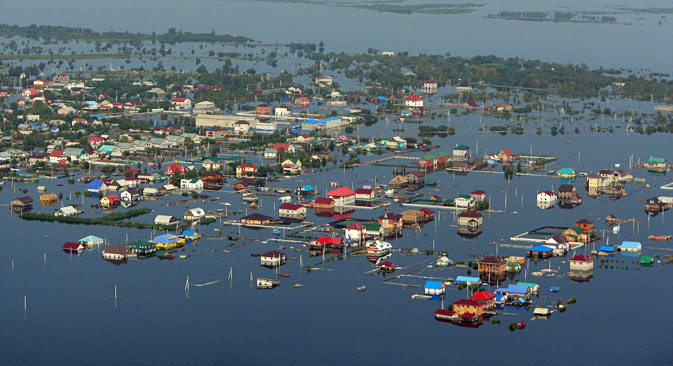 Russia's Far East is experiencing its most severe flooding in recorded history. Russia’s Far East has fallen victim to unprecedented flooding that is far worse than its oldest residents can recall or since records began. The afflicted area covers 400,000 square miles — the equivalent of Oklahoma, Texas and New Mexico combined. The outlook worsens with every passing hour: Tropical rains lash down endlessly, as hydro-electric dams strain to pump water from reservoirs into China’s Songhua River. Local authorities believe that, in the worst-case scenario, up to 100,000 people may have to be evacuated from flooded towns and villages in the affected area. Twenty-one thousand people have already had to flee their homes. One victim of the floods is pensioner Alexander Lyovin, from the tiny village of Kukelevo in the Jewish Autonomous Region. Although his home was flooded and he finds walking hard, Lyovin met all offers to be evacuated from his house with a firm refusal. Eventually, a vehicle from the Emergency Services had to be sent to rescue him. Nikolai Kolesnikov, the fire chief for Leninsky District, had to help this adamant local pensioner to safety with his own hands. The regional administration has arranged temporary, emergency accommodation for flood victims in schools and colleges. School gymnasiums are tightly packed with rows of mattresses. The army has mobilized portable washing facilities and a bakery; the evacuees are being fed, and doctors and psychologists are on hand to assist where needed. Some desperate homesteaders in the Far East have flatly refused to move out of their flooded homes. Instead, they've moved to upper floors and attics, taking whatever undamaged valuables they can with them, to safeguard them from looters. In the deluged village of Vladimirovka in Amur Region, one tenacious old babushka is hanging out, perched on the roof of her home. Categorically rejecting all offers to be evacuated, the old lady says she has seen worse things in her life. Those attempting to approach her waterlogged home are met with a shot from a flare-pistol from the old lady. The floodwaters have wrecked harvest hopes: The flood has hit the principal agricultural areas of the Russian Far East. The aerial view from the helicopter is appalling; in isolated spots, a few rows of soybeans or wheat-stems can be discerned, under a screen of greyish-brown mud. Everything else is under water, as far as the eye can see. Amur Region is Russia's primary soya-growing region, producing more than half of Russia's soybean crops. There is no trace to be seen of them under the water. The islands along the Amur River have been disappearing below the water, one after another. The latest to begin sinking under the floodwaters is Bolshoy Ussuriysky Island, known on the Chinese side of the river as Heixiazi Island. One part of the island is Chinese territory, and the other is Russian. Electric power has been switched off on both the Russian and Chinese sides, and the inhabitants evacuated — although the border guards remain at their posts. Regions in China’s Heilongjiang Province, which are separated from Russia by the Amur River that forms part of the international border, are also suffering from similarly catastrophic flooding, with fatalities currently at more than 200. So far, no deaths have been reported on the Russian side. Huge resources are being thrown into the battle to save people from the flooding. Transport planes are flying into the region daily, bringing mobile hospital equipment, dam-building gear, food supplies and medical aid. Tons of vaccines have been flown in and rushed to flooded areas, where residents are being vaccinated for dysentery and hepatitis. Thirteen thousand Emergency Services workers have been brought into the affected area from other regions of Russia. Perilous water-levels are rapidly approaching the Far East's principle city, Khabarovsk. The last recorded flooding here was in the 19th century, when river levels hit 20 feet. The water is already lapping at over 23 feet now, and experts fear that, if nothing changes, it will hit 26 feet within a week. Khabarovsk stretches for over 30 miles along the banks of the Amur River; its embankments have been strengthened in anticipation and work continues around the clock. Construction workers, soldiers and volunteers have been stacking the city's central embankments with numerous sandbags. In places, the water gushes through the flood defenses being rushed into place, with waves that hurtle down the city's roads and threaten residential buildings. The events that threaten to bring havoc to local residents are part of normal life for the Amur River. “The river itself won't be damaged by the flooding. What we see happening now is the river's natural cycle. The river, its valley and flood plain are all completely used to this, along with the wildlife around,” says Alexei Makhinov, a member of the Russian Academy of Sciences and the deputy director of the Institute of Water and Ecological Problems.